In "Old Possum's Book of Practical Cats" – the poetic inspiration for the Tony Award-winning musical "Cats" – T. S. Eliot describes a cat named Mr. Mistoffelees who is "always deceiving you into believing that he's only hunting for mice." Eliot's light verse portrays another cat as "a fiend in feline shape, a monster of depravity" who's called "the Hidden Paw." These feline character studies were intended to be clever and humorous. However, there really is a dark side to cats. Over the past 40 years the number of domestic cats in the United States has tripled. Cats are now believed to be the most abundant predator in the Lower 48 states, with an estimated 96 million in homes and credible estimates of feral and stray cats ranging from 30 million to 80 million. This proliferation of pets has had unforeseen consequences for wild birds. Truth is, there are practical cats and impractical cats. Practical cats are those who only kill pests like house mice, rats and the occasional wild voles or shrews that find their way inside our homes and other buildings. Impractical cats are feral or free-ranging animals that kill billions of wild birds, mammals, reptiles and amphibians every year. Our world is inhabited by far too many impractical cats. It is illegal to release cats into the wild in Alaska. Nevertheless, the law is not well enforced, many abandoned and free-ranging cats are fed outdoors by people, and regular feeding stations can become cat colonies. A "rescue group for animals with special needs" is asking state and local governments to legalize the proliferation of feral cat colonies in Alaska. Mojo's Hope has submitted a proposal to the Alaska Board of Game to drop "sterilized feral cats" from the state's list of domestic animals that cannot be released into the wild without a permit. [Read Proposal 62 here] The board begins a week-long meeting in Anchorage on Friday. Allowing people to release cats and feed colonies of feral cats outdoors is a very bad idea. Despite the purring assurances of Mr. Mistoffelees, cats kill a lot of wild animals. Even when a cat merely bites or claws a bird, it often dies because bacteria on a cat's gums and teeth are lethal. Karen Munday, a specialist at a wildlife treatment center in Portland, Oregon, says "A bird is more likely to survive a gunshot than a cat bite." Hundreds of scientific studies have documented local numbers of wild birds and mammals killed by cats. A meta-study conducted by Scott Loss, Tom Will and Peter Marra in 2013 combined the best of these studies into an estimate of the carnage wreaked by cats in the United States alone. Merging the estimates of cat populations with a range of estimates for kill rates, the researchers concluded that cats kill 1.3 to 4 billion birds and 6.3 to 22.3 billion mammals annually. Billion. With a "b." The Municipality of Anchorage, including 700-square-mile Chugach State Park, has far more cats than all wild predators combined. According to Anchorage Animal Control, which uses the American Veterinary Medical Association calculation tool, Anchorage has more than 73,000 pet cats. That doesn't include feral cats. By some estimates one-fourth to one-third of North America's domestic cats are allowed to roam freely and are considered to be feral or stray cats. The Humane Society of the United States and several scientific studies have estimated a community's feral cat population at one-tenth the human population, which suggests approximately 30,000 feral cats in Anchorage. Thus, a conservative estimate for the combined total of domestic and feral cats in Anchorage is about 103,000 cats. Multiplying that figure with the lowest estimates for mortality rates in the national meta-study yields an estimate of 1,148,000 birds and 5,975,000 mammals killed by cats in Anchorage each year. If this estimate seems high to you, ponder this: with as many as 103,000 cats, the estimated kill averages about 11 birds per cat annually. Some pet cats kill no birds, but it takes no stretch of the imagination to realize that many cats, particularly feral cats, kill more than one bird a month. I suspect this estimate is low. It's the sheer number of cats that is driving the high kill estimates. This unnatural drain on wild birds is a relatively recent phenomenon. There were no house cats in the western hemisphere before 1492. And as long as those cats are roaming around outside, they are killing birds and other wildlife. Even well fed cats hunt. Most TNR advocates aren't scientists. They just love cats. And they repeat the feel-good nostrums concocted by the most vocal proponents like Becky Robinson, president of Alley Cat Allies. 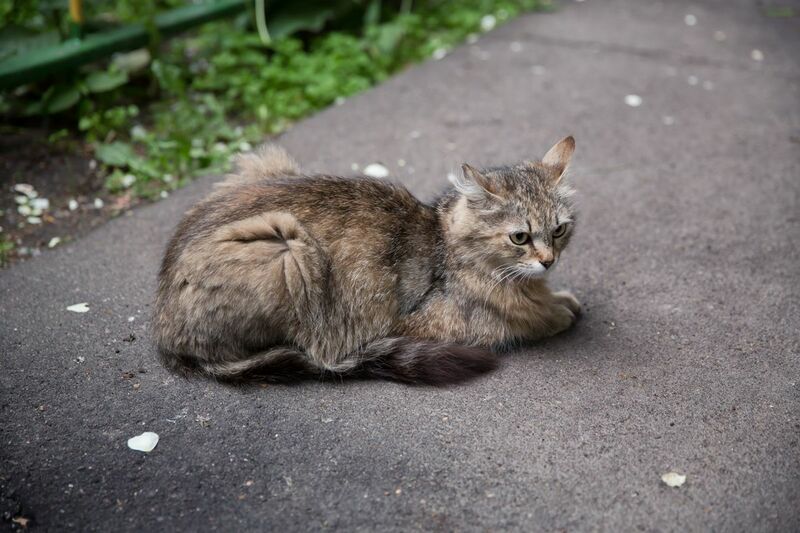 Alley Cat Allies claims to be an "advocate for all animals," but the organization has a laser-like focus on feral cats, while essentially ignoring their impacts on other animals and people. Not doctors without borders, but hoarders without borders. Alley Cat Allies claims that "outdoor cats are part of our natural landscape" and "their home is the outdoors – just like squirrels, chipmunks, and birds." If cats are "natural," then dogs and rats are natural. Are we ready for feral dog colonies? Hold on, feral rat colonies are already a thing. I've found seven instances in North America where a person was harboring anywhere from 200 to 2,000 uncaged rats in their home. Last year 600 pet rats were taken from an Ontario woman's one-bedroom apartment and – here's the best part – put up for adoption by local humane societies. As it happened, homes had to be found for more than 600 rats because many were pregnant when surrendered to authorities. Does this sound crazy to you? It's no crazier than maintaining a feral cat colony. Perhaps cat people and rat people are two sides of the same coin. Interestingly, both insist that their favored pet won't harm the environment. Robinson and Alley Cat Allies insist that free-roaming cats are not a threat to bird populations. They come to this conclusion only by ignoring or disagreeing with every bird expert who believes otherwise, and there are a lot of them, not "a small group" as Alley Cat Allies claims. A new study technique, affixing "kitty cams" to individual cats, is revealing even more kills than previously thought. Attempting to obfuscate the issue, TNR advocates insist that most birds are killed by human-related causes, like pollution, towers, and windows. They seldom acknowledge that cats themselves are a human-related source of mortality. When the 2013 meta-study demonstrated that cats are a greater source of bird mortality than all other human causes combined, Robinson called it "part of a continuing propaganda campaign to vilify cats." Meanwhile, the Alley Cat Allies' propaganda campaign contributes to cat lovers' confusion. A recent survey in England found most cat owners failed to perceive or acknowledge that cats harm wildlife, and 98 percent were unwilling to keep their cats on their property. Justifications included "but other wildlife is harmful to wildlife" and "my cat chooses for herself whether to stay in or go out." Similarly, a nationwide survey of TNR advocates found that 59 percent believe feral cats fill a natural role as predators (23 percent were "unsure") and 79 percent believe feral cats should be treated as protected wildlife. Alley Cat Allies claims that TNR "decreases the size of colonies over time," that it is "successfully practiced in hundreds of colonies," and is "grounded in science." Like climate change deniers, TNR advocates ignore the preponderance of scientific evidence, but love to cite a few flawed studies and anecdotes that they believe prove their point. Three of the most commonly cited studies were conducted in Rome, Italy, and on college campuses in Florida and Texas. The Rome study is one of the worst I've ever seen. Relying on reports from undoubtedly biased cat owners, the researchers found more cats were neutered in 2000 (1,424) than supposedly existed (1,293). One year there were fewer reported cats (765) than registered cat colonies (965). Best of all, the authors concluded "all these efforts … are a waste of money, time and energy." The Texas researchers noted, "It cannot be stated definitively that the total number of cats on campus has decreased because the study was not designed to determine this." The primary author of the Florida study admitted in a subsequent scientific article that reducing the cat population on campus would have required 94 percent of the cats to be neutered, a rate never achieved. These are hardly glowing endorsements of TNR, yet they are cited repeatedly by advocates, most of whom, I suspect, haven't read the articles. If TNR can eradicate feral cat populations the proof, as T.S. Eliot might have said, is in the pudding. But, for instance, the densities of rats in Baltimore alleys prowled by feral cats is "remarkably stable," according to research conducted in 2004 which compared rat and cat estimates from a half century earlier. The researchers found that cats did not rely on rats as their predominate food, but scavenged on many of the same food resources as the rats. In other words, the cats were eating garbage. Chicago, which has some 650 managed feral cat colonies, was named "the rattiest city in the nation" by Orkin, the pest control company, in 2013 and 2014. In 2015, the city allowed a local TNR organization to release 3,500 more feral cats. Meanwhile, the estimated rat population climbed from 33,000 in 2014 to an anticipated 50,000 rats in 2016, leading Orkin to name Chicago the rattiest city once again. According to the American Veterinary Medical Association and the Humane Society of the U.S. estimators, Chicago is home to 660,000 pet and at least 270,000 feral cats. So the Windy City has 20 times as many cats as rats. The real "monster of depravity" is this: every year that TNR caretakers are allowed to subsidize high densities of impractical cats by feeding them and loving them to pieces, billions more wild birds and small mammals are killed by these cats. If Alley Cat Allies really is an "advocate for all animals" what about all those chipmunks and squirrels and birds?